If you Love Color and Variety then You Probably Would Enjoy Creating a Cottage Garden at Your Home. SHOP OUR NEW GARDEN SUPPLY STORE, FOR EVERYTHING YOU NEED TO CREATE A COTTAGE GARDEN, THAT WILL MAKE YOU PROUD! The picture n the right shows off the color from the variety of plants in this small cottage garden in my front yard. The whimsical birds add some interest. This picture was taken a few years ago. Now I have transplanted divisions of mums around the tree. There are also some bulbs planted there. They bloom in the spring time. This helps to give the garden color several times a year. Here is a wonderful resource about growing a beautiful flower garden. Check it out today!Click Here! Place a garden bench in your new cottage garden or anywhere in you landscape for an inviting place to relax and take in the view.You can find a beautiful selection of garden benches at the Shop from the link above to a great selection of outdoor garden benches! Or Click on the small photo of the garden bench on the right to go to our Home and Garden Store! When you are working in your cottage garden, you are going to need a good potting bench as the go to place for your garden supplies. Check out the link below for a great selection of garden benches! Rented Mule Home and Garden Store Shop from the link above to a great selection of outdoor garden benches! Check out the link below for a great selection of potting benches! Features: Polyester folding chair with steel frame. Includes 5 popular garden tools. Detachable bag allows for multiple uses. 1 Trowel. 1 Spade. 1 Weeder. 1 Hand Held Rake. 1 Garden Fork. Cottage Gardens provide privacy and the design is informal. They can be placed anywhere in your landscaping. The cottage garden style is more sprawling with lots of color with plants growing up from everywhere within the allotted garden space. Cottage gardens are also densely planted. With a refined rustic look. More of a natural look and certainly not formal in any way. I have several areas in my landscaping that would be considered cottage style gardens. 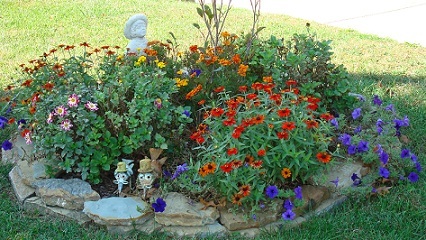 These flower gardens are very colorful, very dense, informal in style and have a natural rock border surrounding them. Tip- I do suggest having some type of border around your landscape areas to define then from your lawn. This also aids in mowing an weed trimming. If not then the old saying stands "Mom's flowers- Dad's weeds." Because somehow the flower garden gets mistaken for the weed patch without a border. I am not the one that mows around here but humm, we won't mention any names here. The cottage garden style, then, is not just any informal style. It is, rather, specifically a style plentiful in its use of a diversity of plants of varying heights, forms and textures, arranged so as to give an impression of abundance -- with a touch of whimsy. Go ahead, have fun with the design. Hang signs in your garden for a fun whimsical look. The picture above is on of the Scrappy Signs I make from Kentucky Barnwood. Typically, in cottage style gardens the plant beds will be wide, irregular shaped with a variety of annuals, perennials, flowering shrubs and flowering trees to provide lots of color through out the season. I would suggest stopping at 3 - 4 colors to avoid over doing the color. Plant flower beds along the house wall and replace the typical evergreens which are so commonly over used everywhere! Vine or rose covered trellises look great to soften the look of the wall. Plants are usually planted in 3's and 5's instead of pairs to avoid symmetry. Use the same plant types in more than one bed to have repetition. Layer the plants with tallest in the back, shortest in front with the middle plants loosely scattered in between. The cottage style design in not rigid in the fact that a group or taller plants should not be used toward the front if ample sunlight is provided. So go ahead and "just do it", If you so desire. Of course you don't want to bury your shorter plants behind alot of tall ones because then you cannot enjoy them. The picture below shows the cottage garden we created in our side yard...story below under CASE IN POINT. This cottage style garden has plants and flowers of various heights in it. This new garden area is still under construction. Flowers with tall spikes are favored in the cottage style gardens. Gladiolus are a good choice, so are foxglove. Install a garden arbor with your flowers to provide lots of height among your flowers. Hyacinth bean vine is a favorite of mine, I grow it each year over arbors, obelisks, trellis, posts etc. If you are not familiar with the hyacinth bean vine, it is a annual, but it sometimes comes back randomly from seed on the warmer zones. The blooms are purple, and the pods are a dark purple. Full sun is best. Order Flower Seeds to start your own Cottage Garden From Freda's Favorite Flowers Collection here. If you are interested in purchasing seed, again you are in the right place. Just look for the information on flower seeds on this website. Click on the link above to go to my the Flower Seeds page of the Rented Mule Home and Garden store, and see the selection of flower seeds. I grow lots of flowers in my private garden and sell the seeds each year. 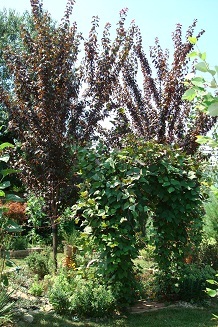 Use wrought iron trellis's and arbor , ( like the one in our backyard, see the picture above). Also use fencing, post, topiaries obelisks, anything plants can grow over for trailing vines, climbing roses, morning glories etc. This will add more dimension in your cottage garden landscape. The arbor pictured above has hyacinth bean vine growing on it this year. Use rustic hardscapes instead of modern for the desired look. I use lots of wrought iron items through out my entire landscape design. I have a large wrought iron arbor with a large trellis on each side as my main focal point in my front yard landscaping. The rose covered arbor adds privacy from the front street and sets the casual cottage garden style up as it is covered in "blaze" red climbing roses. The climbing roses are now completely covering the arbor and trellises. I trim them back each time they bloom for the best performance. Try this idea - Plant a cottage garden beside an informal pathway, use stepping stone or natural rock for the walkway. 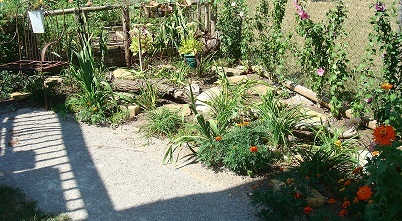 The picture above is our new daylily garden -still in progress, It was covered with stone after this photo was taken. When we started this project we did not have this many changes in mind, but as projects do with us, one idea just grew from another. Be warned this could happen to you! If it does all I can say is - I hope you enjoy your new space as much as we do. We now have a very pretty cottage garden in what used to be an unused side yard. The backyard feels bigger and we don't miss the side yard at all. This year we modified our fence line at the back of our house. This involved removing an under used gazebo and filling in the space. We sold the gazebo on craigslist, with the ad stating the buyer removes it.So that part was easy! The gazebo was gone in 2 days and we were ready to begin. We extended the fence line forward, closer to the street. We did this because we never used the side yard, and felt it was wasted space. We moved the fence forward about 20 feet. The existing fence is chainlink so we had to continue the chainlink fencing forward. I don't like the look of chainlink fencing. We planted a row of rose of sharon bushes ( these were starter plants - tiny offspring from our other bushes in our secret garden at the back of our property, so they were FREE). The intention is to let the rose of sharon bushes grow together and hide the fence from our side. And give us added privacy. I planted the rose of sharon bushes very close together, (amazing how fast these plants grow). I water my landscaping often, especially any new gardens, or young plants. I already had a gorgeous perennial variegated vine on a trellis near the new location of the front gate of the fence and the vine in also growing over the front section of fencing. I prefer the plants over the fence, and the chainlink gives the vine something to grow up. This area is a high traffic area because we have to go thru there to get to the rest of the back yard and our new vegetable garden. The grass was not going to hold up with the construction, the dogs and us. (And grass is well, boring!). We are still working on all of the details but at this point we have a curved pathway that will eventually be made out of natural stone and pea gravel. We removed the sod and applied class I sand to the path as a base. The edging on the pathway may be made from used brick to match the house. We have created a beautiful daylily garden - with a wrought iron bench, at the curved area of the path, ( beside the vegetable garden). The look is very inviting and interesting as you approach it. There are several rocks placed in this area. See picture above. I found a tree stump in our firewood we use for our outdoor firepit. The tree stump is forked, I placed it in the back corner. I placed a partial trunk of a tree laid on its side in the daylily garden. (These natural hardscape elements tie into some areas of the front yard landscaping). The new function for this space is much better than a side yard of grass than just had to be mowed. I have already spent more time in that area of the yard this year than in all of my other years combined! By next year the chainlink fence will not even be noticed in the background when the rose of sharon bushes are leaved out. The bushes also provide a multitude of color when they bloom. I placed a variety of colors all along the area. I have planted tall glads at the fence beside the garden, and vine is growing over the tall post on the corner. 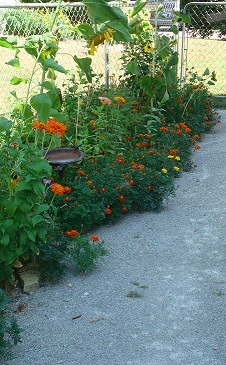 Then there is a mixture of sunflowers, elephant ears and more marigolds in a planter in front of the vegetable garden. All this combined with a vegetable garden that in fenced in with posts from a barn we reclaimed and you would have to say the look is charming, rustic and cottage like. The picture above is one of my birdhouses on the fence post of my new vegetable garden next to the daylily garden. I have birdhouses on the garden fence and trellis area of the garden. Rooster planters made of wrought iron are placed in the daylily garden. Rooster figurines are placed in the planter built in beside the house. They are surrounded by perennials including hibiscus, sedum, mums, hostas, and vinca vine. It is definitely informal in style. So I consider this another cottage garden in my landscape. As you can see by my description there are also lots of hardscape and decor items in the design. I had all of the items in other parts of my lawn, and moved them to the new area. By moving things around it makes something old, feel new again. 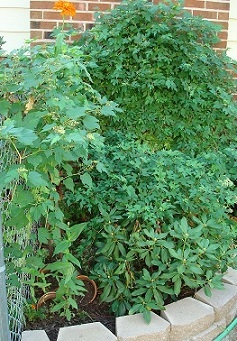 The picture below shows the variegated vine growing over the chain link fence. This vine has added alot of privacy from the front. my gardens and more here.